San Francisco Whale Watching is ready to take you out of San Francisco's Golden Gate in search of several species of whales and other marine life of the California Coast and the Pacific Ocean. 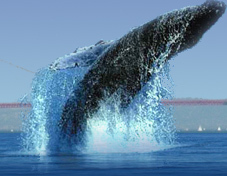 California Whale Adventures offer year round Whale Watching Tours out of San Francisco ’s Fisherman’s Wharf. The waters surrounding San Francisco and the Gulf of the Farallones offer a variety of Marine life viewing opportunities. Our whale watching trips target the Farallon Islands and/or Point Reyes Sanctuary, where we often find Humpback Whales, Gray Whales, Blue Whales and even occasional Killer Whales. Our whale watching trips to the Farallon Islands Islands may encounter other marine mammals including Dall’s Porpoise, White-sided Dolphins, Rizzo whales, Harbor Porpoise, Elephant seals, Northern Fur seals, Harbor seals and, California Sea Lions. Marine mammals like these are all common on our whale watching trips. We also see hundreds of Pelagic Birds. Bird watching is excellent in the Gulf of the Farallones and at the main Farallon Islands.